Got my Lulu books back. I think I have gotten the whole pdf, bleed, live and inactive space thing figured out. The 7.5"x 7.5" square book does have the cream paper with the matte black, dense ink. Looking good. I ordered another 20 Memento Mori #1 with perfect bleeds etc. and need to get the belly bands readied for my ready hands that come on Thursday (that is, my dear high school helper). Christmas is coming. My mother wants five books albeit before her friends started raving about the piece thought the book was wierd and pretty much untouchable. Now, they are holiday gifts. My mother-in-law has piped up about more that she wants to buy. Imagine. A little ho ho ho, whoa. Also have all the holiday cards coming in--samples from one client, proofs from the printer for the other. 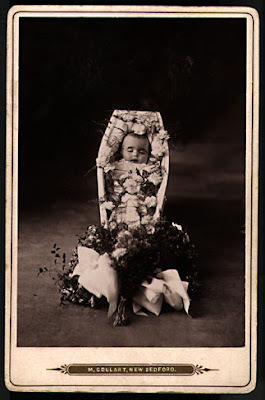 Was trolling the web to look at victorian death photography which I used to think was fascinating. Now, I don't know what to think. The whole maudlin focus on the physical--victorian window dressing with the corpse posed in some "natural" position, dressed in their finery with candles and a flowery bower just seems strange and separate from that of the Puritans who viewed death as a marriage with God the spiritual union from which a marriage in life is a mirror of. The physical was left behind with the Puritians--and a celebration of this spiritual marriage transcended the body. The victorians seemed to dwell with the physical--pure and never decaying. Seeing these little children in their buttoned shoes with little plaid dresses with big white collars posed with their toys or propped against a pile of pillows framed by flowers and fabric.